Why is the “this question might exist” search better than the normal search? I have noticed a thing while asking new questions. I often try searching SO for the answer for some time. With no success, I try and write the title in the Ask Question page, and what do you know, the answer appears magically. Today I finally managed to come across a reasonable example of this. 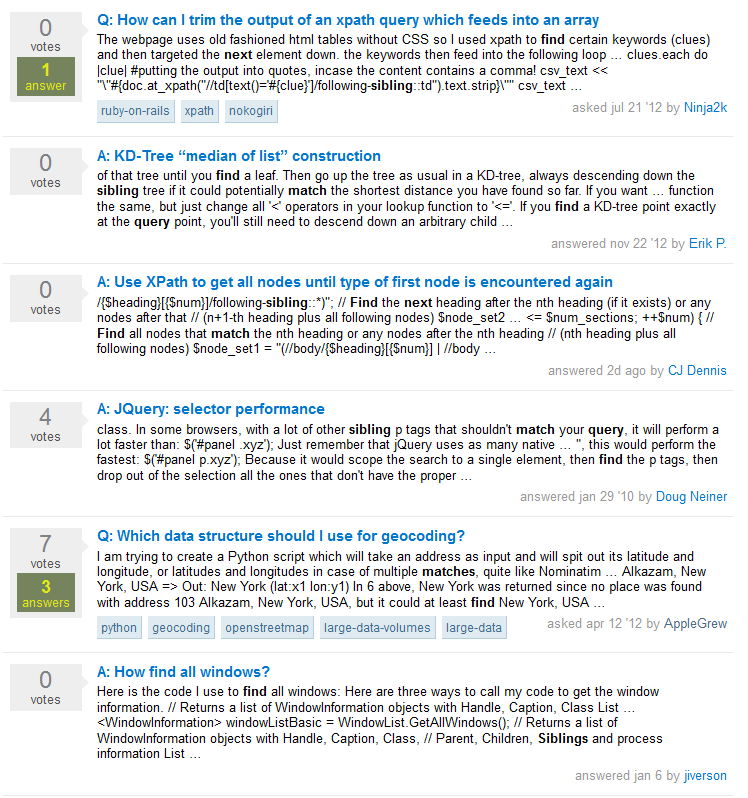 My question's title was "Finding the next sibling that matches a query". Here, the first link answers my question. I know the normal search finds posts based on them containing the search terms. But how does the "this question might exist" search find the results so much better? I believe this kind of search, as it seems to work better than the normal one in most cases, should at least exist in the normal search options, if not be the default one. However, I do think SO should improve their "advanced search". You cannot replicate the "Ask Question" search with title. title seems to accept one single word only. Example title:finding gives 18784 results - title:finding the returns 0 results. Not the answer you're looking for? Browse other questions tagged discussion search . Why is the “search” feature not consistent? Regular search and “ask a new question” yield different results for already asked questions. Why is it? Is the “Questions that may already have your answer” search available elsewhere? How could I have dealt better with this “too broad” question?